For some reason I have consistently forgotten to make this necessary post. Probably the Devil is at work. 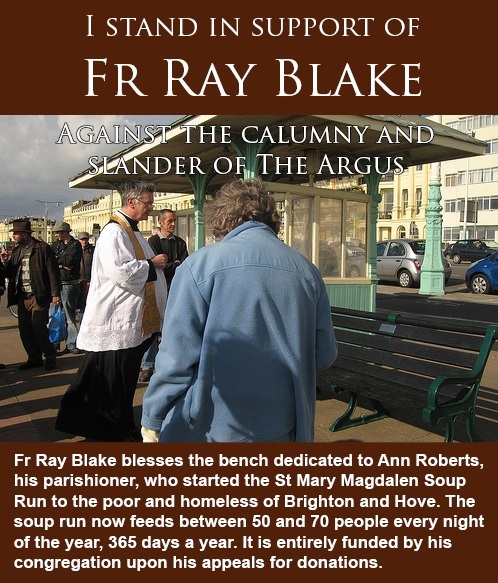 You will probably have heard of the vile hatchet job done on an insightful blog post by Fr Ray Blake, a parish priest in Brighton, by a grand-standing journalist in that town’s local bin liner, The Argus. Many of us have indeed been supporting him in prayer. Others have been more active and vocal. Bloggers are uniting in support of him by posting the banner below. Oh yes, our boy saw a chance to get some cheap points in and took it. He got 5 minutes of fame, but it was a Pyrrhic victory for him: he’s damaged goods now. Fr Blake was highlighting one forgotten truth: we are commanded to care for the poor precisely because it is not easy. The ‘poor’ are human just like anyone else, so some are good, some not so good. So when a not-so-good rich Christian comes across a not-so-good poor person, Christ invokes his commandment. Partly because this is because it is an obvious way to share his Cross (after all, from a purely human perspective, it surely would have been a tough call for Him to die for ungrateful, selfish wretches like us); and partly because he identifies not with the perfect but with those in most need of love and mercy: what we do to the least of my brethren you did to me. Christ is veiled in the Eucharist AND (though very differently) in our neighbour, be he the very least among us. If we could remove the veil we would have no problem exercising our faith. But we cannot remove it, so living out our faith stays tough – and therefore all the more worthwhile in His eyes. Sorry – I am getting really preachy now. To bed!